Yes, madeleines belong to the family of fancy French tea cakes. But, other than the specially shaped pan needed in the recipe, madeleines are made out of ingredients that are most likely in your pantry. This classic madeleine recipe makes 20 little cakes and has two main flavouring agents: brown butter and lemon zest. With these two combined, every delightful bite will have that fresh lemony aroma and rich, nutty flavour. I remember serving my first batch of madeleines to our house guests and they couldn’t help but ask how they were made. If you have guests coming over for a visit, then it’s the perfect excuse to have the tea ready and and impress them with this easy recipe! Put your whole eggs and granulated sugar into the mixer bowl and whisk them together at high speed for about 3 to 5 minutes. Stop mixing once you have reached ribbon stage, which means your mixture has turned pale and thick. You can also do a ribbon stage test by drawing a figure 8 on your mixture, which should briefly stay on top then slowly disappear back into the mixture. While whipping the eggs, place your butter into the saucepan then turn your butter into buerre noisette, which literally means brown butter. Do this by melting your butter over low heat and allowing the fat and milk solids to separate and turn into nutty brown bits. Pour your brown butter into a container to cool and stop it from cooking further. Set aside. Meanwhile, combine your milk and zest together in one bowl. Use a separate bowl to mix your flour, baking powder, and salt. Set both bowls aside. When your egg and sugar mixture is ready, switch to medium mixing speed then pour the brown butter into the mix. Turn off the mixer and remove the bowl. Sift half of your dry ingredients into the egg mixture and fold by hand using a silicone spatula. Fold the milk and lemon next, followed by the remaining dry ingredients. Transfer your madeleine batter into a smaller bowl, cover with plastic wrap, then let it chill in the fridge for 2 hours. While waiting, you can start preparing your madeleine pans by brushing each cavity with soft butter. Coat the moulds with some flour, tapping out the excess. Then place your baking pans in the freezer to set the butter and flour. This will make the baked madeleines easier to unmould. Preheat your oven to 190C. Take out your mould and batter from the fridge then use a spoon or piping bag to fill each cavity. Do not fill the moulds completely to the top as the batter will still expand and rise in the oven. Fill each cavity halfway to give each baked madeleine that lovely seashell shape. Place your madeleine pan on a cookie sheet and bake for 10 to 15 minutes or until golden brown. 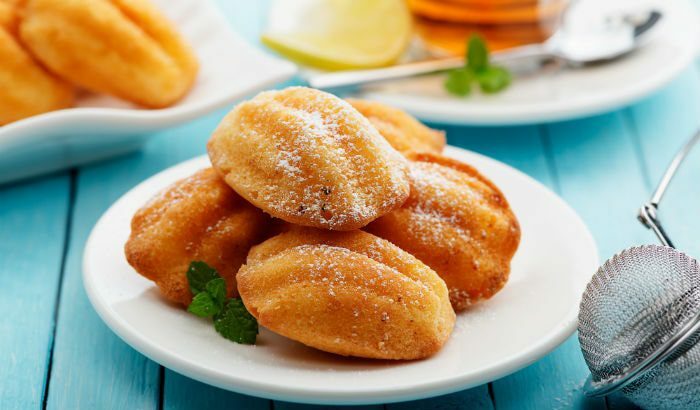 Let your baked madeleines cool completely on a cooling rack before dusting them with some icing sugar. If you are more into chocolate pastries, you can always dip your baked madeleines in some melted white or dark chocolate. Before the chocolate sets, sprinkle the dipped part with chopped nuts for added crunch. Want something savoury? Adding some grated cheese and your favourite herb into the batter makes your madeleines the perfect snack or appetiser. Thank you for the lovely Madeleine recipe. I am a little disappointed that you shared American terminology for ingredients and measurements. The recipe was derived from an Australian website. It would be nice if you re-wrote the recipe to suit Australian cooks. Hi Anita! We apologise for the error. We already corrected the ingredient list and added measurements in cups and spoons, though we recommend having your ingredients prepared using a weighing scale. Have fun baking your madeleines at home!